Everyone has a story to tell. So have you. Why not say it? Better still, why not write it? There is an eager audience out there to listen to you, to read you. What better medium to publish your book than as an eBook! It costs almost nothing and has reached worldwide. In India, eBooks haven’t caught on as they’ve has done in the US or UK. But soon enough, traditional books will make way for its electronic cousin just as handwritten letters have given way to emails and lately to WhatsApp. If you wish to be an author, you need to be technically ready to face the change that’s about sweep over the publishing scene. At the moment, about 25% of all books published in the West are e-Books, according to a 2017 survey by Smashwords. The trend is on the rise. There is one significant disadvantage though. The ease of publishing has flooded the eBook market with substandard literature. Any and everyone puts up whatever he/ she can type and calls it an eBook. It sometimes gets difficult to separate the wheat from the chaff. I wish to caution the budding authors not to be in a hurry. Instead, have the patience, sit and write a great story which you are sure the world will love to read. Then edit and re-edit like you do when you submit your manuscript to a traditional publisher. We all know Amazon Kindle as a popular eBook platform. Some of us might also know a few other retailers like Apple iBook. There are several other platforms that host eBooks for sale. Then there are eBook libraries that lend these books for a fee just like brick-and-mortar libraries do with physical books. 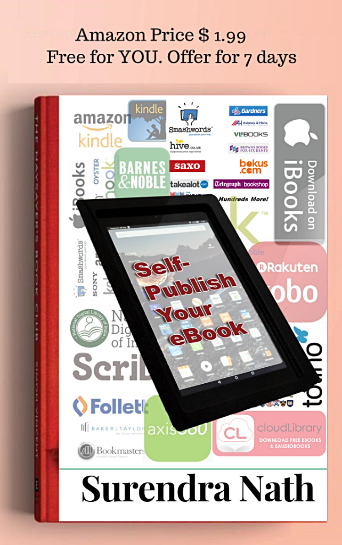 What do you need to do to publish your own eBook? First of all, you need to write your book. I assume you’ve taken my advice to write a great story and edit it perfectly, without errors. Then you need to convert your Word file into an eBook format file. This usually gets done by the platform where you upload your manuscript in Word format. But unless your word file is in a specific format, the conversion will not take place. To explain with an example: You must have read many eBooks. Have you noted that with a single click you can jump to the Table of Contents and again with another click you can come back to your chapter? It can only happen if you create your Table of Contents according to specific guidelines. What are the eBook formats? How do you prepare your eBook as a Word document? These and plenty of other questions are answered in a guidebook titled, How to Self-Publish Your e-book. Right, it’s an e-book written by yours faithfully. It’s a step-by-step guide that covers all aspects of self-publishing. How to format, create a Table of Contents, insert images with an emphasis on the cover picture, what should be the Front matter, the Back matter, and how to upload to all the above-mentioned eBook platforms. Surendra Nath is a writer and translator. He has translated two volumes of poems titled Kavyanjali Vol.1 and Vol. 2 to English, originally written by Padma Shri Haldhar Nag in Sambalpuri-Kosali language. His has written two novels – Karna’s Alter Ego and Kavach of Surya. He also has several eBooks to his credit.